A new fleet of Grove rough-terrain cranes is helping one of Peru’s largest copper mines to triple its production output. 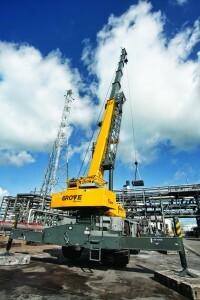 The Gove RT9130Es, RT880Es and RT765E-2s were assembled at Manitowoc’s factory in Passo Fundo, Brazil and supplied to Graña y Montero Holdings’ (GyM) copper and molybdenum mi ning complex in southern Peru. The units are assisting the company with the US$4.6bn mine expansion project, which will enable GyM to expand output from 120,000t to 360,000 per day, providing additional annual production of 272,000t of copper and 7,700t of molybdenum by 2016. GyM said it chose Grove rough-terrain cranes because their standard features were ideal for mining site use.